The Arts Fund, located at 205C Santa Barbara Street, will heat up this Friday evening with an opening reception for HEADS UP: Beauty, Angst & Power. This show is curated by the Arts Fund’s own Nancy Gifford and the Santa Barbara assemblage artist Susan Tibbles. Virginia McCracken of Green House Studios is having a show in Carpinteria! 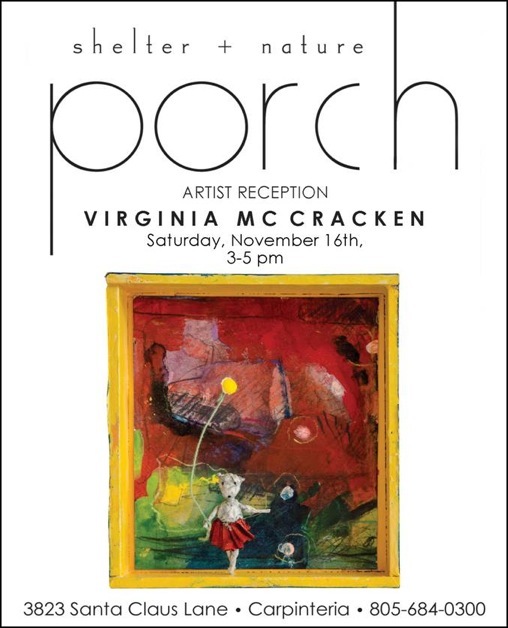 An artist reception will take place this Saturday from 3-5 at PORCH, a boutique home and garden shop. Explore Virginia’s small scale assemblages, worlds created around enigmatic and distinctive papier-mache creatures. Her work will be on view until December 30. Thirdly, the newly-opened Santa Barbara Art Foundry invites Funk Zone visitors behind the scenes of artworks in progress. Head down to 120 Santa Barbara Street Friday night for continuous tours of their bronze foundry and gallery showroom.